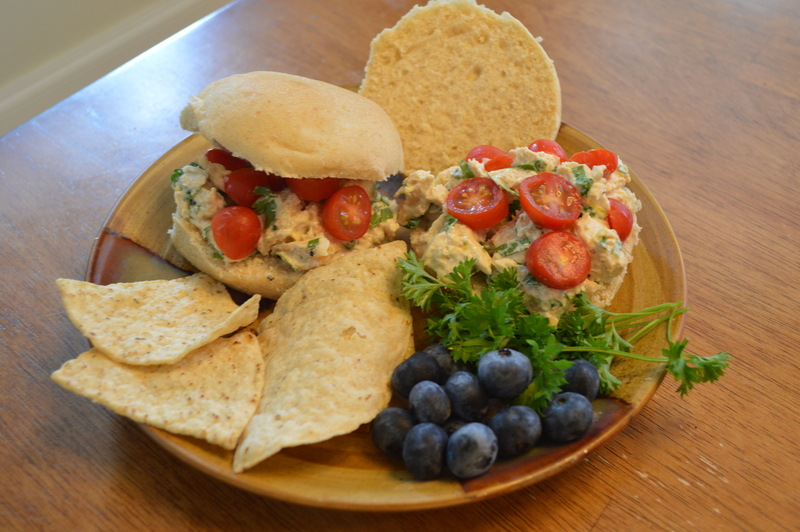 LIGHT Chicken Salad Sandwiches – Dancin' and Cookin' in the Kitchen! These were pretty good! I wanted to add a couple more ingredients to them, and I will put them as “add-ins” on the end, but to keep them light, I did not. So… Here it is! Add ins: craisins and walnuts!!! YUM! Cook chicken tenderloins until fully cooked. I put about 1 Tb olive oil into skillet, heat until rippling slightly, place the frozen chicken tenderloins into pan. Sprinkle with salt and pepper, and a little bit of the 21 seasoning salute from TJ. Turn half way and cover. Total cooking time approx. 10 minutes. When the chicken is done, set to the side and let rest for 5 minutes. When done resting, cut into small cubes. Then let cool. After cooling, combine all ingredients in a bowl. I put mine on the homemade rolls that I’ve mentioned in previous posts. You could do on bread or rolls, or in a Romaine Lettuce leaf for low carb. YUM! This entry was posted in Main Dish, Mid-day and tagged chicken salad, greek yogurt. Bookmark the permalink.